I'll put some of the inevitable gloom-and-doom reports of the Red Sox/Rays game after it's over should the score hold up — still 5-0 Rays, Sox fans booing — but let's not forget there's also a Monday Night Football game this evening between the NFC East leading New York Giants and the still-waiting-for-Brady Quinn Cleveland Browns. The woman seen above is Cleveland's "second most famous Browns fan", Debra Darnall, who is nicknamed the Bone Lady for reasons which are hopefully obvious. Darnall has taken her love of the Cleveland Browns and latent mental illness and turned it into a positive. [D]ebra has realized that she is simply following her soul's path and only by doing that will she be truly happy. She is certain that so many of the positive things that have happened to her are because of this character she has created and her decision to follow her dream. 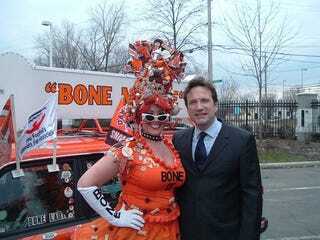 She was honored in the Visa Hall of Fans at the Pro Football Hall of Fame in Canton, Ohio as the 2001 Fan of The Year for the Cleveland Browns. She has had opportunities to work with many charities and also promote sportsmanship with other ultimate fans while inspiring people to "be who they are." "Debra Darnall has been the life of the party ever since the Browns returned."